Thank you for the pleasure of your friendship and goodwill during the past year. Team Daviot wish you a wonderful holiday and a New Year full of happiness and prosperity. School reopens on Thursday 7th January, 2016. I look forward to seeing you all again then. Many thanks again for your incredible support. This entry was posted in Uncategorized on December 22, 2015 by daviotblog. 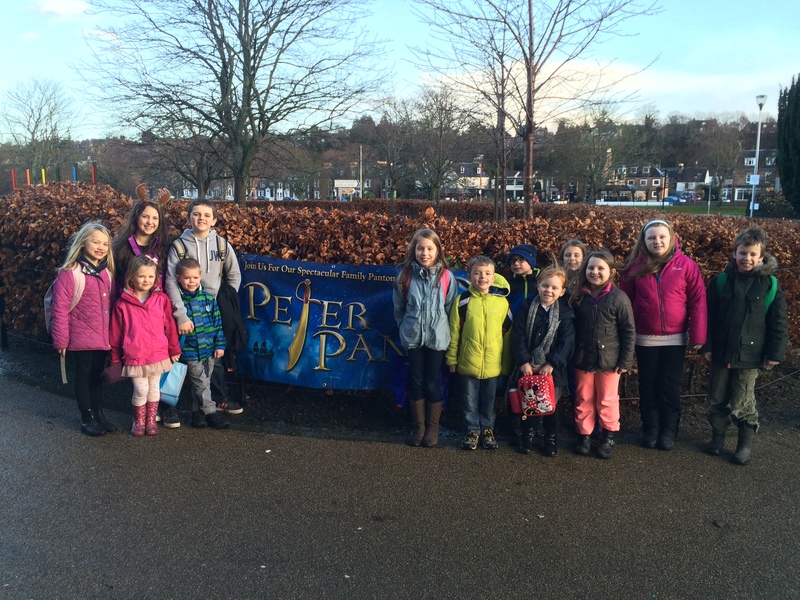 Team Daviot had a great time at the pantomime this afternoon. It was a lovely way to end the term. I would like to personally apologise to all the parents for the amount of time they had to wait to pick up their children. The panto ran a lot longer than advertised. However, I really did appreciate the support with the transport arrangements. I would also like to say a very big well done to our younger children who sat so well for such a long time. I was so proud of them. They have all grown up so much this term! I am just adding a quick message to thank all parents for the wonderful selection of party food they provided yesterday. The pupils enjoyed many of the leftovers before our visit to the pantomime today. Mrs Mackinnon suggested parents may need the containers back before the holiday period. Therefore, we have put the dishes and Tupperware not taken home in the poly-tunnel for easy collection. I hope that is OK with everyone. Thanks again for your amazing support. The parents at Daviot Primary always surpass my expectations. This entry was posted in Uncategorized on December 21, 2015 by daviotblog. I would like to say a huge thank you to Auntie Angie for coming out to the school today. She came along with her metal detector to try and find the elusive Daviot Primary Time Capsule. In all honestly, I have rarely encountered a family who offer their time so generously and enthusiastically as the Macleods. The pupils had an amazing time. We found lots of metal objects, including, very excitingly, a musket ball! I like to think it could date back to the Battle of Culloden (1746) – which would be amazing!! Unfortunately, we still haven’t located the capsule, so Angie and Rory are going to come back in the holidays to keep looking. Consequently, our Time Capsule topic will overrun into the New Year. Angie is also helping to coordinate a reunion of the pupils who buried the capsule all those years ago. I will keep you up-to-date with developments. I think I’m going to buy myself a metal detector. Treasure hunting is awesome! This entry was posted in Uncategorized on December 18, 2015 by daviotblog. Our P7 pupils had a brilliant time at the Transition Ceilidh this morning. I promised not to embarrass them with lots of pictures, so nothing for the blog. However, I am so pleased they enjoyed themselves. It was also great to hear that they met some new people. Our P7s will be having many more transition events next year. Not long till the big move now! Thank you to everyone who responded to the email and blog post regarding catering for the school party. I value your support immensely. I would also like to thank the parents who offered to provide any items that were not covered on the list. Please see the completed list below. If any of these items cause difficulties, we would welcome any other party food (i.e. the ‘Other’ category). The party is on Monday afternoon in the village hall. It will start at 1pm, and it will finish at the end of the school day. Travel arrangements will not be affected. Pupils are welcome to come to school in their party clothes. Alternatively, they can bring them to school and get changed at lunch time.